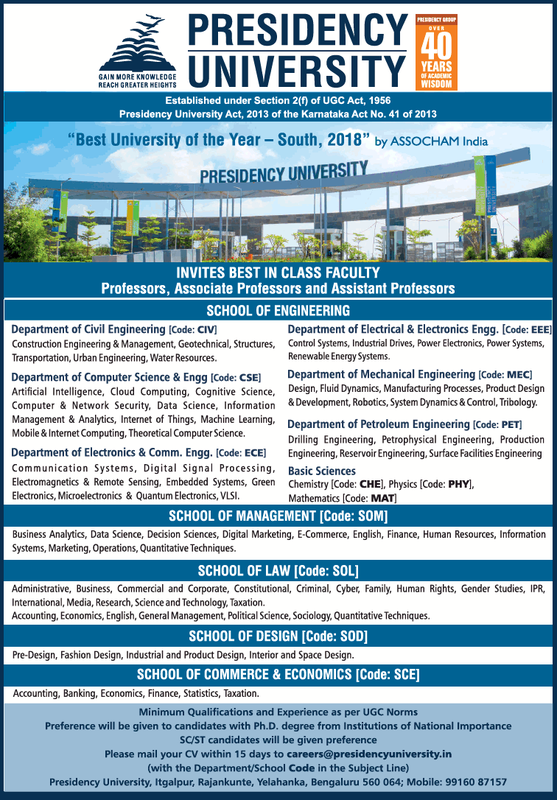 Presidency University, Bangalore has advertised in THE TIMES OF INDIA newspaper for the recruitment of Teaching Faculty- Professor / Associate Professor / Assistant Professor jobs vacancies. Interested and eligible job aspirants are requested to apply within 15 days from 06th February 2019. Check out further more details below. About University: S R I C T is about finding solutions to social exclusion and disintegration and will look to work with private, public and third sector partners in stimulating cohesion, entrepreneurship, economic development and involvement in neighborhood renewal and regeneration within community of chemical industries at Ankleshwar. As per UGC norms. Ph.D candidates and SC / ST candidates will be preferred.